1) Fancy a stimulating discussion on Montserrat 20 years after the start of volcanic activity? Then be at the St. Patrick’s Lecture – Thursday March 12 – Montserrat Cultural Centre – Professor Clarice Barnes discusses “Volcano at 20 – Discerning Shifting Rhythms and Beat.” She is expected to highlight local cultural influences, including music and dance traditions such as the Masquerade, in explaining how Montserratians view trauma, coping and resilience in the twenty years of volcanic eruption experiences. Professor Barnes will tune your attention to the ancestral memories that influenced those behaviours and link us to the enslaved African uprising of March 17th 1768. 2) Bunkum Bay turns in Leprechaun Valley once again for this all night fete with the Hypnotik Media crew. Leprechaun’s Revenge takes place Saturday, March 14 from 8PM and doesn’t end until after you’ve had a really delicious Caribbean breakfast. Free shuttles are available from St. Peters with Blessings Bus Service. 3) Aqua Montserrat’s All-Inclusive Rendezvous is on Sunday, March 15. Tickets to this private party are US$100 and in limited quantities. You will get the full Aqua Montserrat Star Treatment of snorkeling, spear fishing if you dare, drinks, fresh catch on the grill, music and drinks. Check them out on Facebook for more details. 4) Sunday night March 15 is for the children as the MUT’s Junior Calypso Show happens at Salem Park. These talented kids compete for cash and prizes and present calypso and stories of Montserrat from their vantage point. Start time is 7PM. 5) Hope you are not planning to rest yet. The Slave Feast happens on Tuesday, March 17 in the heart of Salem. 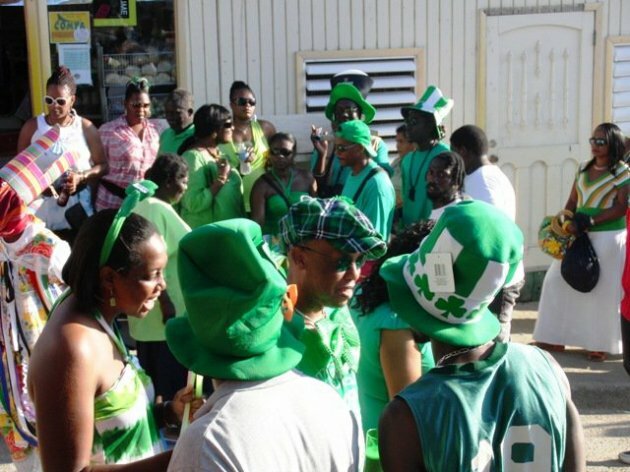 Join the parade from the Montserrat Secondary School from 3PM and be sure to dress in your favourite St. Paddy’s Day character or historical figure. Come hungry so you can sample some of our favourite local dishes including Goat Water and Duckna, homemade ice cream. Live bands and lots of entertainment to take in. Check out our Calendar for a List of All the Events on the St. Patrick’s Festival.